Thank you to the people of the Thruway Authority and Tee Zee Constructors. They have been absolutely wonderful…. not just in helping with the coordination of my driving across the bridge, but in all the work they have done on the bridge and for the community. The old TZ Bridge was designed to last for 50 years and I suspect was never anticipated to accommodate the 130,000+ daily crossings that has punished its infrastructure. If you know the bridge, you know it really has that 50s era highly functional erector set feel. I am certain it has seen more than its shares of Model As. For those who followed my road trips a few years ago, you might remember the excitement I had when I first crossed the bridge to start a drive to Boston and the thrill that I had when I crossed it on the way back home. The old bridge an essential part of Rockland County. Let’s talk about the car…. The Phaeton did great. In retrospect, I should have adjusted the generator for night driving — but that is just my paranoia for draining the battery. Aside from that the car started beautifully and the engine sounded great. Folks have been asking, “how did you get to be the last car?” My official response, “I got lucky”. My unofficial response, “I emailed a lot of people, spoke to more, emailed more, offered up rides, was respectful and genuine with my requests and got lucky”. I probably should answer, “I’ve been stuck on the side of the thruway in the Model A enough time that I figured that they wouldn’t even notice me there anymore”. 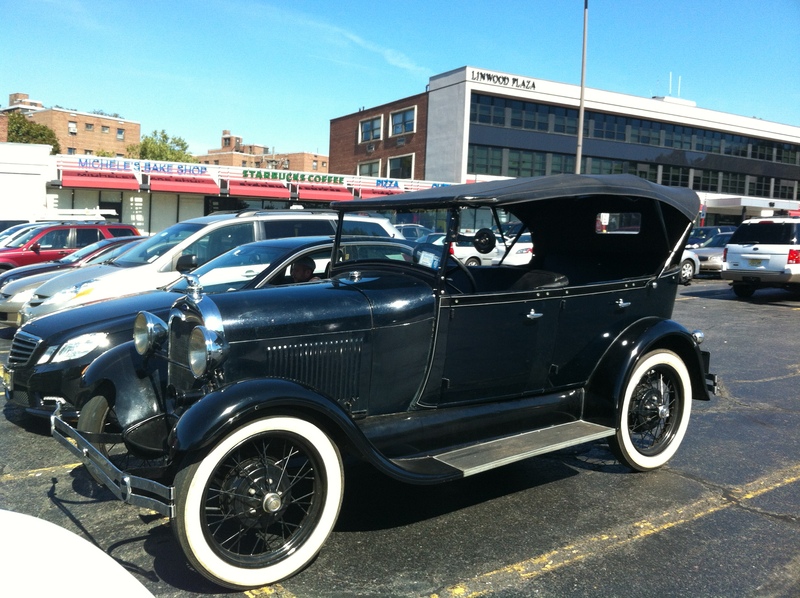 Regardless….. My Model A was the LAST CAR OVER THE TAPPAN ZEE BRIDGE! How awesome is that! This week I had the opportunity to pitch some work to two potential clients on the NJ side of the George Washington Bridge. What better reason could one have to take a mini-road trip in an old car? If I can get the video to embed, you should be able to see me driving in my suit and then hanging out at Strictly Bikes where I needed to make a quick repair to the malfunctioning electrical system. The car drove beautifully on the Palisades Interstate Parkway. Today was one of those days that EVERYONE stopped to take photos of and with the car. I am curious if any of these people will come across my blog. It was fun on the PIP doing 50MPH and having car after car waving and folks taking video/potos. It is only a matter of time for one of these people to post their photos to their Facebook page and for me to eventually get a call or an email from someone else saying “I just watched a video of you driving on the PIP in your car…. a friend posted it to their page”. The repair I had to do on the road was something odd. The ammeter stopped showing positive charge. To me, this would typically indicate an issue with the “cut out”. The cut out is a device that shuts off the generator when the car is “off”. Without it, the generator will start running like an electric motor, can overheat, start a fire and will burn down your car/garage/house. Sometimes this piece can get stuck in the “off” position. Sometimes they “fall off” the generator. If you have an original one, you “tap it” and it typically starts working again. I replaced the broken original one on my car about 6 months ago and do not have a back up, so if the one I have breaks, OUCH, I need to get the car towed. The original cut outs are really neat. They are basically small electro magnets that turn on/off a switch and disconnect the generator from the car. My “newer” one is a diode version, which replaces a whole lot of cool mechanical things with one small diode that only allows electric current to flow in one direction. It shouldn’t break down. To fix the problem I was having, I wound up cleaning connections and jiggling some wires between the generator and the ammeter. Basically, I tapped things a little and hoped the gods of automotive goodness would smile upon me. Special thanks to Steven from the bike shop for heading outside to help. …. oh, and I landed one of the assignments I was pitching. I just need to write an engagement letter before I can get started. The second pitch was for something more long-term and I won’t know about it for a few months. In addition to the pitches, this mini-road-trip also included a stop at workfriend/client’s beautiful and historic Englewood Cliff mansion. He has been hearing about the car for about a year and I told him that I would stop by and take him and his 5 kids for a drive. Two of the kids were so excited that they didn’t bother opening the doors to the car to get in, they just “dukes of hazarded” their way OVER the doors to get inside. I am glad I have a “driver” level car that welcomes a little abuse. It was surprizing that his other three kids had no interest in leaving their video game to even look at the car. If this client sends me a photo of the two kids with the car, I will post the images.